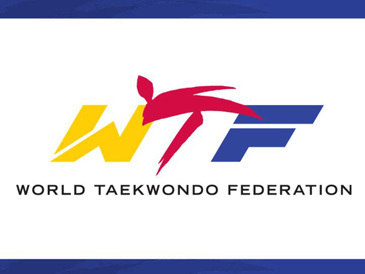 MADRID, Spain (April 12, 2005) – The World Taekwondo Federation (WTF) elected a new leadership here today that will carry out its ongoing reform programs over the next four years. After 32 years, the WTF also launched a new logo symbolizing a bold new beginning and a truly international identity. The WTF General Assembly unanimously approved a package of reform recommendations, which the Reform Committee produced after months of work. At the 17th WTF General Assembly held at the Hotel Convencion in downtown Madrid, participants elected Chungwon Choue, president of the WTF, to a four-year term. The assembly also elected three vice presidents. In the presidential elections, Choue earned an overwhelming 122 votes, while Sun Jae Park of Italy garnered a mere 10 votes. The three elected vice presidents are Dr. Nat Indrapana of Thailand, Soo Nam Park of Britain, and Kamaladdin Heydarov of Azerbaijan. 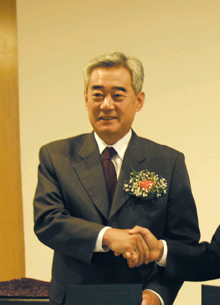 For the continuity of the WTF reform initiatives, Choue nominated the WTF´s acting secretary general, Dong-Hoo Moon, to serve as the secretary general over the next four years. "Under new leadership and a new logo, the global taekwondo family will go forward, with united strength. Today we truly deliver Korea's gift to the world," Choue said. He said the WTF's ongoing reform efforts would greatly help enhance the status of taekwondo and its world governing body, WTF, among the international sports community. "Our reform process should not stop and it should continue even after taekwondo is included as a permanent Olympic sport, as we strongly believe that our efforts will contribute not only to the development of taekwondo, but also the global Olympic movement," Choue said. Participants in the General Assembly also approved the new memberships of five National Taekwondo Associations, increasing the total number of its membership to 179. The new members are national taekwondo associations from Sao Tome & Principe, Vanuatu, Algeria, Mozambique, and the Democratic Republic of the Congo. The WTF General Assembly selected China as the host country for the 2007 WTF World Taekwondo Championships, after Turkey withdrew its bid at the last moment. 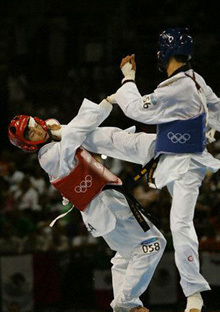 It also gave Korea the right to host the first WTF World Taekwondo Poomsae Championships in 2006. With respect to recommendations of the WTF Reform Committee, which calls for the WTF General Assembly to be held every year, the WTF decided to hold its next General Assembly in Ho Chi Minh City, Vietnam, in 2006. About 1,700 athletes and officials from a record 125 countries are scheduled to attend the 2005 WTF World Taekwondo Championships, which kicks off tomorrow for a five-day run at the Palacio de Deportes.